It’s difficult to predict the results you’re going to get from traditional marketing. This means that more often than not you’re making a guess when you plug your marketing results into your business plan. Inbound Marketing on the other hand is completely predictable and there is plenty of data to back that up. You can make a business plan, complete with realistic goals for your marketing results, when you’re doing your marketing under an inbound marketing strategy. To make it easy for you to determine the results that inbound marketing will achieve for your business, we’ve created our Inbound Marketing Calculator spreadsheet. All you need are your current numbers for website visits, leads and sales and it does the rest. Enter these values and it will tell you what inbound marketing will produce for your business after 6 months, 12 months and 24 months. If you’re not sure about these numbers, just have a guess. If you don't have last years number, again guess and make them a little smaller than this years. Click on the button below to download the spreadsheet to try it for yourself. Read on to learn more about how we calculate these results. The website will calculate the growth you have achieved on your website for the past year along with the growth you can achieve by implementing a typical inbound marketing strategy. The spreadsheet shows what a typical inbound marketing program will achieve for you in 6 months, 12 months and 24 months. 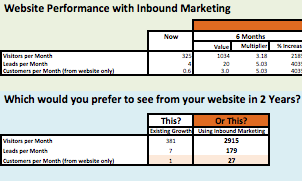 The bottom table in this worksheet compares what you will achieve with inbound marketing to what you would achieve at your current growth rate after 2 years. The image below shows an example of a typical B2B website. In this example we see 26 more customers produced each month by the website after executing a typical inbound marketing strategy for 2 years. Think about your ideal client, what is their lifetime value to your business and how much revenue will 26 more customers per month produce for your business? These results are calculated from data provided in “Return on Investment from Inbound Marketing through Implementing HubSpot Software - January 2014”. This is an annual report by the Massachusetts Institute of Technology. Data from over 5700 websites where inbound marketing is being implemented is analysed allowing typical results to be predicted based upon the starting point. Our spreadsheet has a second worksheet which shows the multipliers you can use to determine the results you’ll get. I have included a copy of these tables here for your reference. You can see from these tables that the results you get from Inbound Marketing using the HubSpot software are quite predictable and depend on where you’re starting from. The results are obtained through doing 6 to 10 hours per week on your inbound marketing. Because the results you achieve through inbound marketing are predictable. You can easily create a business case for starting your inbound marketing. Knowing your average lifetime customer value and how many customers your website will produce over a given time for a given expenditure, you can determine whether inbound marketing is worth pursuing.